Day of Philanthropy in Crawford County! #Giving2sday 2018 Final Results are in! #Giving2sday 2018 has been our best annual campaign to date! With this year’s overall total of more than $167,600, we surpassed last year’s total by more than $11,000! Each fund received a little over $0.17 per dollar from the Board approved amount of $25,000 on all the funds that they raised. Special congratulations to the top earning funds in the categories of school, agency, and scholarships funds. The winners are the Galion Community Education Foundation Fund, the Marian E. and Norman H. Maynard Bucyrus Public Library Fund, and the Wynford FFA Rising Sun Scholarship Fund respectively! Each of these funds received an extra $500 donation. Special thanks to OneIT for contributing the $1,500 that made these three $500 prize incentives possible! 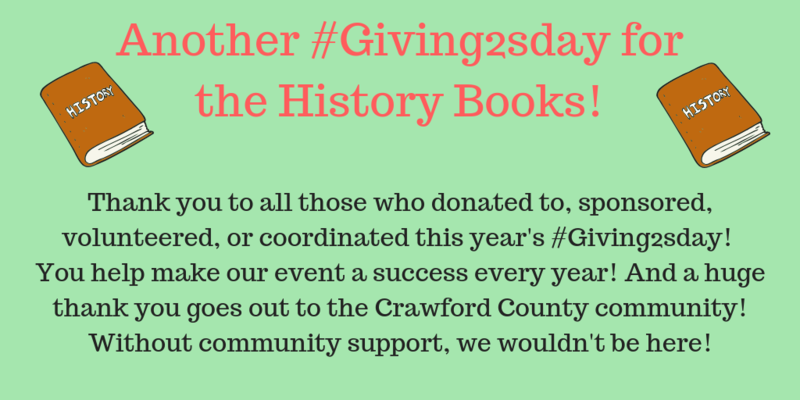 Thank you for helping us ensure a forever future for Crawford County!